What if we did it for you? BUT... COULD YOU MAKE MORE? You could if you included video ads in your campaigns? Can you make a good video ad? Are you comfortable in front of the camera? Most people aren't great at either being the face on screen or simply don't have the time or know-how to create an effective video ad… So we made it... so you don't have to. You know video ads are powerful right? We all see them whenever we want to watch a YouTube video. Then the engagement, clicks and sales are through the roof. You don't want to make the video ad do you? Done For You Campaigns . . .
We wanted to make VS2.0 as simple, user friendly and effective as possible so we decided to produce a set of DFY video ad campaigns for you to use in seconds… With just 1 click! Case Stu2: Here's how it works – watch this short video first. But How Can I Use These Videos on Multiple & Different Projects? And we've put together 5 killer campaigns designed to make you money from day one. "Wait… don't buy it. I can see you're interested in this product and I know it's tempting to just click the link and buy it now… but don't do it"
Hmmm… You're going to sit up and take notice right? That's what happens with Campaign #1… a short 'Reverse Psychology' video ad you can drop onto any product video sales letter or review which will force people to click your link. Remember you can use this pack to promote any affiliate product you like… adding it is just 1 click away. This campaign is designed to use specifically within the health niche… OK, but why the health niche? Because the health niche offers the quickest route to constant and evergreen profit… and no we're not joking, if your just getting started, here's our (or rather Mark's advice); make the health niche your first goal because… Well, it's easy. Mark insisted we include this campaign as this is exactly where he started… Did you know that he made almost $124,000 in one niche in under 6 months without a list, money or experience?... yes he was a Newbie when he did this. About this video: This video is taken from Mark's own archive to demonstrate / show some of the income he generated daily / weekly from one niche. Results shown are not as a result of using this VS2.0 pack and provided only to justify how profitable the health niche can be. It's no secret that promoting a popular product launch is one of the quickest and most consistent ways of making an online income. Why does it work? The easiest way of describing why a popular product launch is popular… is BUZZ. Lots and lots of marketers are promoting one specific product over just one small window of time… the product appears to be everywhere… and people want what everyone else seems to be climbing over each other to buy. Launch Jacking amounts to riding that Big BUZZ wave for large and very fast profit… you know it works right? But how do you compete? Competition is actually a good thing… especially when instead of trying to convince people to click your link and buy – you actually give them something for nothing, and then they buy. This is the same method Mark (Hookum Method) and many other marketers have used for years, and is responsible for $1000s in affiliate commission and prizes. Income derived from give-away / free download method. Results shown are not as a direct result of using this VS2.0 pack and provided only to justify potential. Script… Ready to edit if you want to go specific on bigger projects. This pack also centres on product launch jacking simply because it's so dammed profitable (but it'll work for almost any affiliate product). Income derived from using Bonus / review pages to promote offers. Results shown are not as a direct result of using this VS2.0 pack and provided only to show potential. The angle you'll benefit from with this Video Ad pack is – Additional Value, the very same angle we use over and over again to top leaderboards and collect huge amounts of affiliate commission. "Are you getting as much value as possible by simply clicking a buy button? The Simple answer is – No you're not… Don't buy anything until you see the full review and the additional value you can access for nothing"
If they want that product then why not buy it with all that additional value? And now to our final pack… We're mentioning this pack last because it is a little different from the other four. The 4 packs preceding this one are designed to make you super-fast affiliate income by simply plugging the video ad with your link into someone else's video and it's perfect. However our Local Business – 'Business in a Box' pack has the potential to make you huge spikes of income for a couple of minutes work (using VS2.0). 90% of all small, local businesses struggle with their online presence, branding and lead acquisition… and up until 3 or 4 years ago they really weren't that bothered… but today it's a very different story. First let me tell you what's included in this pack… then I'll explain how we have set this up to sell without actually selling… It'll make sense in a moment. Sure the pack is just like all the others… but here's where things are a lot different. Question: why don't online marketers sell to offline business? Answer: Because they don't like face to face or telephone selling. It's true… most of us are not born to sell, at least not face to face or over the phone. So we designed this pack to sell itself. How… by simply giving the finished video to the business without asking for a dime – That's right… they see the finished video you've made for their business and you never asked for anything in order to do it. But… if they like it (and they will) then they'll need to pay you $250, $350 or anything else you decide is fair to remove the dirty great watermark from the video. The Carrot and Stick business model doesn't get any more enticing than this. So, Are You Ready To Make Money? 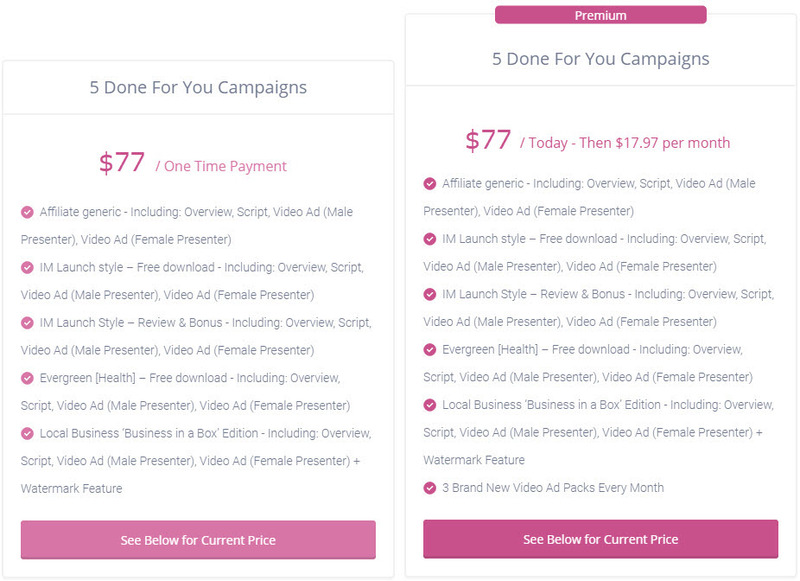 Option One: One-time payment… Unlocks all 5 DFY Video Ad Packs… You pay just once and are free to use any of the packs as often as you like on as many campaigns as you wish. Option Two: 1 payment today followed by monthly recurring payment (as stated above)… Unlocks all 5 DFY Video Ad Packs today… Plus 3 Brand New packs will be added to your account each month for as long as you remain a member of monthly packs. Cancellation: Monthly packs can be cancelled at any point without effecting the packs you have already paid for and without effecting existing campaigns.